You or Me? Who Has the Right of Way? My office is in downtown Atlanta and I drive each day through Georgia State University, which now has an enrollment of 32,802. You can imagine how many of those 32,802 are walking on the sidewalks and crossing busy downtown streets at any given moment on a weekday. 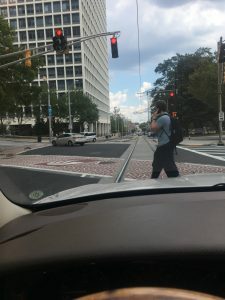 And just add these students to the normal, everyday Downtown Atlanta population of employees, deliverymen, and homeless people, bicyclists who weave in and out of traffic and the schizophrenic Streetcar, which can wait at a station for interminable minutes or pull away without notice at any given second. Suffice it to say there are a lot of pedestrians on our streets downtown. Nearly every day at least one of them attempts to dart out in front of my car, regardless of whether they are even close to a crosswalk. Apparently, crosswalks are for looks only in downtown Atlanta. A driver must be extremely vigilant while driving downtown not to have a mishap with a pedestrian. Add to the inherent danger of crossing a street the aggravating factor that many pedestrians are on their phones while walking out in the middle of the road. I have seen pedestrians talking on their phones, listening to their phones with earphones, texting on their phones, texting on their phones while talking on their phones on speakerphone and every other possible configuration of phone use while walking. Surely, if they are hit this would amount to a heck of a lot contributory negligence? The number of incidents of pedestrians being hit by cars is on the rise. For example, in 2013, 180 pedestrians were killed statewide, making it the deadliest year for pedestrians since 1997. The CDC reported that in 2015 5,376 pedestrians were killed in traffic crashes in the United States. This averages to one crash-related pedestrian death every 1.6 hours. Additionally, almost 129,000 pedestrians were treated in emergency departments for non-fatal crash-related injuries in 2015. Pedestrians are 1.5 times more likely than passenger vehicle occupants to be killed in a car crash on each trip. Atlanta is reportedly the 8th most dangerous city for pedestrians. So who has the right of way? The Governor’s Office on Highway Safety does a pretty fair job at trying to educate pedestrians regarding right of way and their duties to watch out for their own safety, in addition to vehicle driver’s duties to watch for pedestrians.